Fitness Competition Before and After | First Time Fitness Competitor at 38! 38 year-old United States Air Force Veteran and mom of 2, Melissa Colston, completely transformed her body in less than 6 months and achieved her fitness competition dream! In less than 6 months, Melissa made an incredible fitness competition before and after losing 14 lbs of body fat as she gained muscle taking 4 inches off her hips, 2.5 inches off her waist, and more than 3 inches off each thigh! HI MELISSA COLSTON! TELLS US A LITTLE ABOUT YOU! I am an Air Force Veteran, mother of 2, and a wife. I work fulltime for the Veterans Administration and am always in continuous pursuit of keeping an active, fit, and healthy lifestyle for myself and my family. 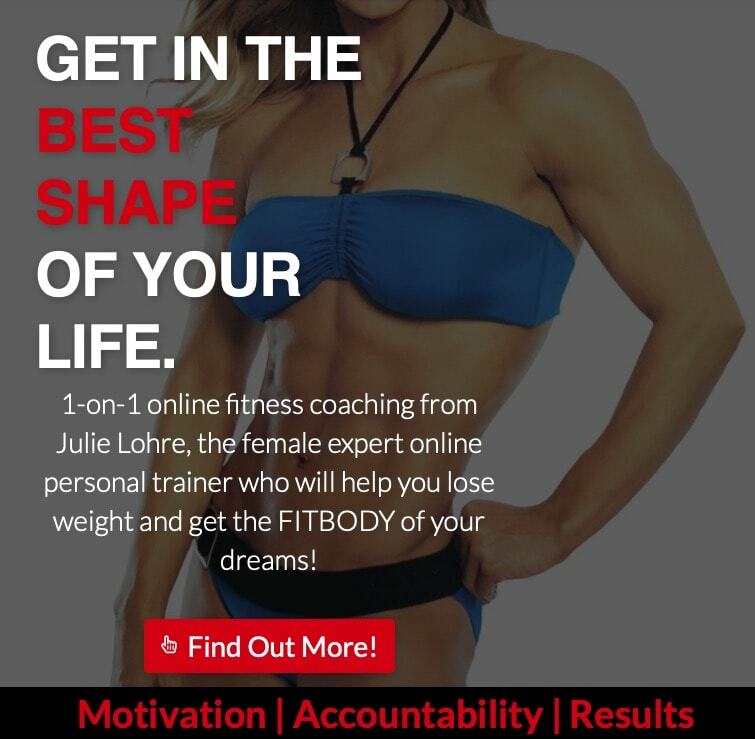 WHAT THINGS HAPPENED THAT LED TO YOU WORK WITH JULIE LOHRE AS YOUR ONLINE COMPETITION COACH? In March of 2018 I signed up for a 25k Buzzard Day trail race 3 days prior to the race occurring with no actual running training behind me for this race. I completed it with a PR and decided I needed/wanted something to really challenge my fitness level and to give me a more athletic physique. So I did some research, considered my fitness goals and decided to enter a fitness competition. This is a new beast for me so I did my research and found Julie Lohre online but still within somewhat of a driving distance for me. This was her forte so I reached out and decided she needed to be my coach. Melissa wins big at her first UFE Fitness Competition! Should You Hire An Online Fitness Coach? Find Out If It Is Right For You! WHAT UNIQUE CHALLENGES HAVE YOU FACED IN YOUR FITNESS JOURNEY TOWARD YOUR FITNESS COMPETITION? I was diagnosed with exercise/heat induced asthma while in the military and at the age of 27 I was diagnosed with Osteopenia and at 28 I was diagnosed with Hypothyroidism (Hashimoto’s). This has been challenging in the fact that I am in continuous battle to maintain healthy hormonal levels to keep my body in balance. Fitness and health have to be an integral part of my life. WHAT WERE YOUR FITNESS GOALS WHEN YOU FIRST STARTED TRAINING WITH JULIE LOHRE? When I started working with Julie Lohre my goal was to be ready to step on stage at my competition. She got me to where I needed to be and the results were two 2nd place finishes in Open UFE Bikini and Open UFE Fitness at my first competition with the UFE (Ultimate Fitness Events). I am now going to pursue my bikini and fitness pro cards in the UFE 2019! BEFORE TRAINING WITH JULIE, WHAT DID YOU TRY TO HELP YOU REACH YOUR GOALS? Before working with Julie and making my fitness competition before and after, I utilized the gym and worked out but once getting with her and doing her programming I really was able to zone in on the nutrition and key exercises I needed in order to achieve what I needed to. I am able to maintain this lifestyle fairly easily due to the training. WHEN YOU FIRST CONSIDERED ONLINE TRAINING, DID YOU HAVE CONCERNS?? When I first considered online fitness competition training I was skeptical that she would just put generalized programs together and not have invested time into me. After speaking to her over the phone she made me feel comfortable with her knowledge and level of expertise in this arena that I gave it a go. She made personalized programs for me and continuously checked in on me. WHAT KIND OF PROGRESS HAVE YOU MADE IN YOUR FITNESS COMPETITION BEFORE AND AFTER? Since I stared with Julie I made significant progress in overall body fat decreases, inches lost, and fitness level increased! On the scale I lost 14 pounds, but that doesn’t really tell the full story. Thighs… down more than 3 inches each! Best of all, I am so much stronger and fitter! I shaved almost 1 minute off my already fast 1 mile run time taking it from just shy of 9 minutes down to 7:38! For pushups, I literally double the strict pushups I can do going from 13 up to 26!!! HOW DO YOU FEEL NOW? HOW HAS YOUR OUTLOOK ABOUT YOUR BODY AND YOUR LIFE CHANGED? I feel great! I now look at my body and food as a machine and fuel. How can I improve this machine? What will make it better? WHAT IS THE BEST AND WORST PART ABOUT WORKING WITH JULIE LOHRE? The best part was her upbeat attitude. The worst was just not working together in person. Heading into competition, we really wanted to defined and shape Melissa’s legs and glutes. While we worked lower body frequently during our training, below is one of my favorite leg workouts that really targets those hamstrings and glutes with a balance of abs tossed in. Below is a sample of the kind of leg exercises I included in Melissa’s leg workouts to help her shape and define her amazing legs! Give this workout a try for yourself! Ready to get started toward your fitness transformation?